If you’d like to see how the rich, I mean the really rich used to live in this country, then you need to experience the Biltmore Estate in Asheville North Carolina. I’ve visited Biltmore three times, once with my wife Jean and Biltmore is one piece of American history you don’t want to miss. The Biltmore Estate is more like a castle than a home as it is America’s larger privately own home with an incredible 175,000 square feet of living space. That means you could fit more than 100 homes, at 1,600 sq ft, the size of ours inside Biltmore. What in the world wouold yo udo with that much space? Well, for one thing George Washington Vanderbilt, builder of Biltmore, was an avid art and antiques collector and traveled the world buying up treasures for his home, which is more like a museum today. During the construction of Biltmore Estate an entire town was built just to house and provide for the needs of the hundreds of skilled workers. A railroad was also built to the site to bring in the massive amount of materials needed for the huge project. Biltmore Estate contains some 255 rooms, a 2 story library, a beautiful sun room, horse stables bigger than most houses adm much more. Biltmore was built to be a sustainable estate with a dairy and winery of which the winery still produces find wine today. And of course you can get a free wine tasting when you take a full tour of the estate. The original estate comprised some 125,000 acres of which somoe 85,000 acres wer sold to the federal government at the time of George Vanderbilt’s death in 1914. Today the estate comprizes 8,000 acres and is still privately owned and run as a tourist attraction and winery. Restoration efforts are always underway and plans currently exist for construction and rennovations through 2012. 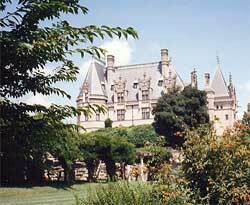 If you plan on visiting Biltmore Estate you can get some great deals on Asheville, NC hotels and accommodations here.